As I set out to write this book in February of 2011, I noticed one thing. Google was issuing press releases and changing the documentation, websites, and api information concerning Google Places, and live streaming “mobile marketing” events at a fast pace. This gave me the indication Google was planning something big. I had no idea how big this was going to be until I went to South By Southwest (SXSW) in March of 2011. Up until now, Google was doing something special in Portland, Or for businesses with Google Places printouts they would affix to their front door for customers to “prove” they are there. Unlike the other location services, there is no way for a user to prove they are actually at the location. That’s the current dirty-little-secret of the location services no one wants you to know. Google is taking a different approach to this by giving business owners a way to validate that users are actually at a business. Google's starting building targeted landing pages for the cities it has been working in with other Google Places projects. As of the writing of this document, there are six cites involved. Once a city is selected, then a landing page with the most popular places are shown. For most cites, it's restaurants and bars. I would expect Google to fine tune this so that the results take user preferences into consideration. If you are uncertain of what these preferences are, please see your Google Ad Preferences. Here's the landing page for Austin, TX located at the url http://www.google.com/city/austin/. Google has even gone to the trouble to stylize the cityscape background image in the header of each city-landing page. See the list of header screen shots below. Here's the Google Places San Francisco landing page. Here's the Google Places Portland landing page. Here's the Google Places Madison landing page. Here's the Google Places Charlotte landing page. Here's the Google Places San Diego landing page. 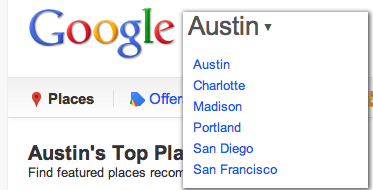 Here's the Google Places Austin landing page. Business owners now have a new landing page, too. www.talkbin.com is a new customer service product Google has release that will grow. Just think of it as a digital comment card system for each of your business locations. During a webinar on Feb 10 named by Google, “Think Mobile,” Google’s Jason Spero , head of Americas Mobile Advertising, discussed the mobile industry and why marketings need to reshape their strategies to the the “mobilized” customer. Google was not expecting it to grow this fast, and changed their own plans to get new mobile initiatives fast-tracked. There's something going on with how we interact with Google using our smart phones verses when we sit down behind a computer at home or work.. There are some sophisticated tools being developed that marketers are using to help their clients game the Google Places algo. Algo is short for algorithm. Watch this short video to see what I'm talking about. Learning the algorithm is seen as the holy grail for SEOs. I'm not an algo chaser. I like to take the approach to help business owners understand that their Google Places page should be taken seriously and will be the first page potential customers will see before finding a website. Therefore, a content strategy should be in place. However, that's not so easy. Being aware that Google Places exists and how it's part of Google Search and Google Maps can be confusing at first, but is another important milestone for business owners. From there, business owners need to make their customers aware of all the Google Places touch points. Marketing initiatives conducted in conjunction with a Google Places page should include creating content like reviews and photos. Check-ins are the even better, because they are votes. As more and more programs are written to use the Google Places (experimental) API, the data signals and the depth of data Google can use to improve rankings will increase. Unlock the entire toolkit pdf systems for only $9. Click the image below to begin saving time, optimizing your online marketing, and generating more leads.